THREE-and-a-half hours ago, this bike was sat in the palm-shaded car park of a Sicilian hotel. Its futuristic, angular lines and silver colourscheme couldn’t have been in starker contrast to the leafy, romantic setting of the peach-coloured building, where sun-kissed young couples lazed around beside the blue-tiled swimming pool. Four hours later it’s in a much less relaxed setting, dragging its centrestand on one of the many hairpin bends to the summit of an active volcano. At the end of the road, 1900 metres above sea level, people wearing brightly-coloured bobble hats and wrapped up in padded suits are skiing down the red run as smoke billows out from the crater a few hundred feet above. The temperature? Eight degrees. The place? As close as you can get to the summit of Mount Etna in Sicily, unless you sling crampons and an ice axe over your shoulder or jump into a ski lift. Two completely different places and experiences within a couple of hours of each other, delivered by one bike. A new, comfy bike that goes around corners, turns quickly and has enough grunt to stay with a 996. And a bike that comes with an ambient air temperature gauge which lets me appreciate the easy and fuss-free way I’ve gone from one experience to the next without feeling achy, tired or bored – but just a little bit colder than I was in the near-tropical February temperatures a few hours earlier. The bike is Aprilia’s RST1000 Futura, a machine based on the frame and engine of the very successful and capable RSV Mille sports bike, but with plenty of changes that make it a completely different machine. And a good one at that. A V-twin VFR800, perhaps, with a few more quirks, a bit more power and handling and the character of a true sports bike, with plenty of soul. It also has a name taken from Aprilia’s sports 125 way back in 1991. I’ll let Aprilia’s Andrea Soriani explain what this new bike is. He said: " The Futura is something different for the sports bike rider who wants to tour, but also a bike you can use every day and for weekend madness. A bike for the man who doesn’t want to ride on the track, but does want to go fast, sometimes with a passenger and with panniers. It’s the first sports tourer that is actually a proper sports bike. We felt 1000cc was big enough for a bike that’s not a sofa with wheels. " I think he’s probably right. The only question is, how does it fit in with Aprilia’s Falco? Well, the Falco is designed as a slightly softer sports bike than the RSV, which means some people have assumed it is a sports tourer. It isn’t. But the Futura is a different kettle of guppies altogether. What you have is the RSV motor with its four valves per cylinder and dry crankcase, new Sagem fuel injection (the RSV uses a Denso system), a larger generator, different throttle bodies, new injection mapping and a power output of 113bhp at the crank. That’s a claimed 5bhp more than Ducati’s ST4 and about 12bhp more than the VFR800. The whole thing was built, designed and tested under the watchful eye of technological genius Pier Luigi Marconi. The frame is based on the RSV Mille, but it’s 4mm longer at the headstock and the wheelbase is slightly longer. It has a weight bias more suited to sports touring and a steering head angle of 25.7° compared to the new RSV Mille’s 25°. The bodywork is all new and it also boasts new wheels, forks, shocks, brakes, a centrestand and a single-sided swingarm. Thankfully, the big one-piece seat which met with such derision on early versions has been redesigned, with new side panels that can be removed to clip the optional panniers straight on and to make it look less fat than the original. Though it definitely looks slimmer and miles better, Aprilia says the actual dimensions of the new seat are actually the same as on the original show bike. A trick of the eye, perhaps? It still looks like a big bike – even though Aprilia reckons it’s no bigger physically than an R1 – but it’s certainly attractive. I must admit that when I first clapped eyes on it, it didn’t really appeal. But when I see it in the sunshine of the hotel car park Aprilia has used for the base of the world’s first test, I begin to find it strangely attractive. 10-spoke wheels. The Futura is also available in a similar blue to the ST4 and a deep candy red. Your eye is instantly taken by the triangular pipe that exits underneath the rear brake light to make it easier to fit the panniers – and, if Aprilia is honest, to make a bold style statement. The pipe set-up with two lots of silencers also mean the bike meets the new Euro 1 noise legislation, and with a few tweaks to the fuel injection for the French and Swiss 100bhp limits, it can conform to the legal restrictions of every country in the world. And that includes the strict emissions laws of the USA – where, incidentally, the bike comes with panniers as standard because, apparently, that’s what most American riders want. Unfortunately, we’ll have to part with around £300 for a set. What is a little disappointing is the sound the Futura makes when it’s cracked up. I’ve owned an RSV Mille and even standard they sound mint, but this thing sounds like a restricted Honda Deauville. Still, don’t write it off just because of that. As a convoy of silver Futuras takes to the road, I make myself at home in the well-finished cockpit – though it’s difficult to feel relaxed given the seemingly no-rules driving of the locals. It’s definitely worth taking a few minutes to appreciate the dash layout. It would have been easy for Aprilia to fit the same clocks as on the RSV Milles, RS250 and Falco. But they didn’t, and well done to them, because the dash is a work of art. There’s a conventional speedo and rev counter red-lining at 10,000rpm. So far, so conventional. But to the right of the dash is a veritable delight of graphics and toys. The fuel gauge looks like a cake cut into slices. Not only does it display in triangular segments how much fuel is left, but it tells you the exact amount in litres, too. Push one of the two blue buttons and it changes to the ambient air temperature. Below that the bike’s engine temperature is displayed in a similar graphic. Push the left button and it switches the left-hand digital display under the speedo to the trip. Oh, and the dash also glows a gentle blue at night – an idea taken from the car world. As we head through town the bike’s a bit jerky until I get used to it. You just have to be easy on the throttle and remember you’re riding a big V-twin, even if it is detuned. But get used to the clutch, which uses lighter springs than the RSV, and you find it’s creamily smooth around town. If only the other drivers were. anyone at any time seems the best way of staying alive. It’s a good thing the riding position is pretty much upright. The bars are high and within easy reach, resulting in a very natural riding position. So rather than having to think about how much your wrists are killing you, you can concentrate on what dangers are ahead. At first, the tall bike feels a bit ponderous at slow speeds, but after a few minutes you get used to it. Running the gauntlet of free-for-all junctions, complete with some very dodgy-looking characters hanging around, we make our way through the town’s streets. The road throws some wet, slippery cobbles, at us just to wake us up and as the firmish suspension bounces me over them I wish I had taken that trip to the little boy’s room before we left. Eventually we get out on to the A18 autostrada and I find the bike’s first problem. This is a sports tourer, right? That means it’s meant to tour and go fast, which inevitably means negotiating tolls and carrying tickets when you’re abroad. But the Futura has no glove box or even a clip to put your ticket in, so you end up screwing it up inside your glove. " What about a tank bag? " I hear you ask. Well, the tank is made out of a form of nylon so it won’t take a magnetic bag – though Aprilia will offer a strap-on version as an accessory later on. After fumbling around at the toll booth, I stash the ticket and finally get the chance to see what the bike is really like in its natural habitat – a sweeping autostrada with the traffic moving at a fair rate. The bike is totally happy as we sit there at around 80mph – and so am I. There’s barely any wind blast and it’s very relaxing to ride at this speed, with plenty of leg room and tank cut-outs even my lanky legs can snuggle in to. With a bit of traffic out of the way I wind it up to 100mph and it pulls pretty well. The fairing keeps most of the warm breeze off me and though my head is getting a bit battered by the wind I am 6ft 4in, and if you’re a rider of more conventional size you’ll probably find yourself in touring bliss. It’s better than the VFR and on a par with the ST4. Most of you will never ride the Futura flat-out, but it’s nice to know what it will do, mister. So I change down and start to nail it, feeling a subtle kick in the power at 6000rpm until it tails off at around 9000rpm on the tacho. It gets a move on, but it doesn’t really feel like it’s going that fast – a perfect attribute for a sports tourer where you need to crack up the miles, but don’t want to scare yourself silly. I tuck my head down and it climbs to an indicated 210kph (about 130mph) as the road sweeps from left to right. I could go faster, but I’m conscious of the " guess what I’m about to do " driving standards in this part of the world and don’t want to push my luck. So I can’t say I had it flat-out, but it should be good for a genuine 155mph. After 20 miles or so of gentle cruising I pay another toll and we head out on to open roads away from the motorway. Unfortunately, to test a bike like this properly it needs a few days in the saddle, but my limited experience indicates it is comfortable for long blasts on dual carriageways. And an experienced pillion who took the motorway on the back of a Futura reckons the pillion seat is a pleasant place to spend time, while the built-in twin grabrails are pretty effective. But what this bike is really about is sports touring, so lets see what it’s like on real roads, rather than unnaturally straight and smooth motorways. The road up to Mount Etna is one of the best in Europe. And it’s not just me who thinks so – just before I went away, I read a piece in one of the Sunday newspapers about driving holidays which basically said if you haven’t driven in Sicily, you haven’t lived. I can see the summit in the distance and it’s eerie. There’s a thick dollop of snow on the top, above which lurks an evil grey cloud. But the cloud doesn’t contain raindrops – it’s produced by the red-hot magma glowing in the volcano’s crater. On a road this fun and this challenging, though, there’s not much time to look around. It was re-laid with fresh Tarmac nine months ago and it’s perfect for riding now. There are no stones, most of the corners are constant radius and the temperature means it’s as hot as a British summer. I dive into a left-hand hairpin, easing the lean angle in as I can’t see round the corner and get on the power. It pulls cleanly from 2500rpm and I can feel the power pulsing as it picks up speed. The rear suspension is a bit soft and it gets a bit of a wiggle on as I get more aggressive with the throttle, but it’s not a problem ands is more to do with my 15 stone of lard than the bike. Once the road straightens up I reach down to my left-hand side to turn the suspension pre-load adjuster up a couple of clicks and can instantly feel the difference. As standard, the bike is set to 14 clicks from soft and there are 45 clicks in total, so there’s plenty of scope for adjustment. A thoughtfully placed chainguard makes sure you don’t lose any digits in the process. After a short 100mph straight there’s an uphill, second-gear right-hander. On the way in I leave the braking late and stamp it down the gearbox. The brakes are perfectly suited to this bike. When you pitch it in you feel the forks dive, but it’s not alarming, and it handles loads better than a VFR. Just like on the motorway at high speed, it’s totally stable on the brakes and it turns on its side well, too, where a VFR would start feeling a bit vague and be digging chunks out of the Tarmac with its footrests. It’s then that a sharp grating noise catches my attention above the sound of the engine – which, incidentally, sounds a lot better on the move than I first thought. The centrestand is grounding out, but the bike is fairly well leant over and it’s only when you really go for it that it scrapes. After all, this is not meant to be a track bike – it’s a sports tourer, remember. The roads are now lined with snow and while the sporty Michelin tyres and suspension are doing their job extremely well, my head is telling me it must be cold on the road otherwise the snow would melt in the sunshine. I back it off a little as I don’t want to risk tumbling over the low crash barriers. Instead, I look at the scenery, with the mountain in the background and the town in the distance below, and start to muse about what this bike is all about. The Futura could live with a sports bike as it’s easy to ride fast without concentrating too much on what it’s doing. What this means is you can get it on its side in a bend, wind the gentle power delivery on through the corner and ride the revs on the way out. It gets a bit vibey, but only when you’re really wringing it. And there’s no point doing that. It’s fast enough to do its thing without killing it near the red line where the power’s already gone off anyway. It’s also a bit jerky on the throttle if you’re in a first-gear hairpin, but often the best thing to do is shift to second and it accelerates just as hard anyway. We stop for a short break next to a hardened lava flow which has engulfed four houses with black igneous rock and I note a couple of other faults. The headlight beam/dip switch is the wrong way round with the full beam set at the bottom and the low beam at the top. The stylish mirrors need a bit more glass to get a proper perspective and the indicator switch doesn’t return to the centre. Annoying, but not enough to ruin a classy package. We get under way again, climbing to the top of the mountain, where we drink some well-earned cappucino with the skiers who are trying to work out who looks weirdest, them or us, in our respective strangely coloured suits. I think they do. The bike is outside, cooling down. It has used 10 litres of fuel from the 21-litre tank, so there’s plenty more to go and it dawns on me. What Aprilia said is true – almost. It is a real sports bike in terms of the way it goes, handles and brakes, even if the acceleration is deceptive and you can travel in first-class comfort. 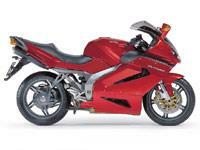 Better than a VFR800? In many ways, yes, but it’s not quite as easy to get on with. Better than a Ducati ST4? Probably, but you’ll have to wait until we’ve had some more time in the saddle with them both together to find out. Right now I’ve got the other side of the mountain to deal with and both me and the Futura can’t wait.